Letters From A Tapehead: Godspeed You! Black Emperor: "Undoing A Luciferian Towers"
Godspeed You! Black Emperor: "Undoing A Luciferian Towers"
As a manifesto for change, there's something interestingly similar to Charlie Haden's Liberation Music Orchestra I hear with "Undoing A Luciferian Towers," the latest single from the seminal post-rock outfit, Godspeed You! Black Emperor. According to the band, Luciferian Towers, GY!BE's upcoming new album, was inspired by the following "grand demands:"
It's an ambitious list. Without getting into the politics and societal implications of these demands, the instrumental of "Undoing A Luciferian Towers" communicates aspiration. From the light and quivering ambience of its beginning seconds to its gradual swell as layers of tone build upon its understated march, there is a mission being carried out here. It's a journey of depths, brass melodies interacting with an eventual maelstrom of sounds that form a gathering that's either in motion or in celebration. 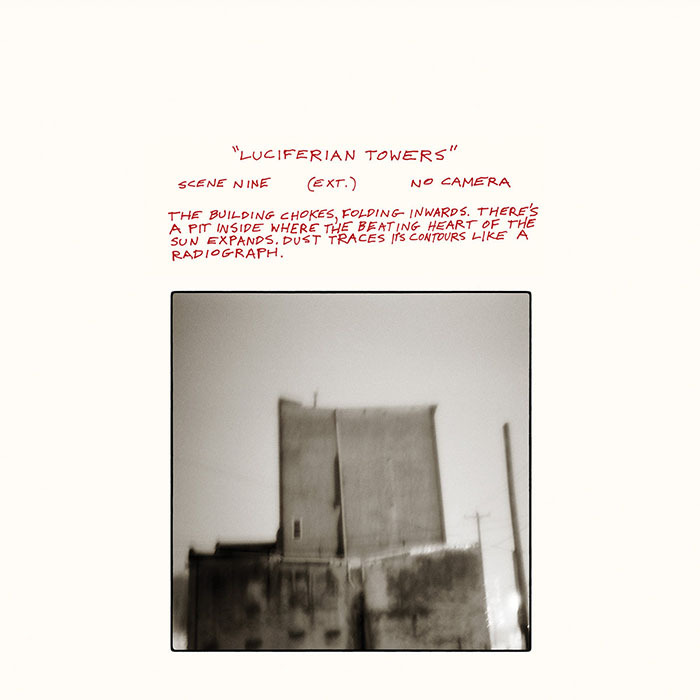 Luciferian Towers is being released on September 22nd via Constellation. You can pre-order the album here. Links, tour dates, and information on the release were provided by Rarely Unable. The seventh record by Godspeed You! Black Emperor, Luciferian Towers will be released 22 September 2017 on Constellation, and today we are pleased to present the opening track from it. Luciferian Towers was recorded during the winter of 2016/2017 at Montreal’s Hotel2Tango, with Greg Norman once again engineering and co-producing (as he did on the band’s previous album Asunder, Sweet And Other Distress). The music on Luciferian Towers took shape over the past two years, amidst GYBE’s collaborative performances with the Holy Body Tattoo dance company’s monumental, and spurred by the commissioning of new compositions memorializing the 100th anniversary of the WWI Battle of Messines, which premiered at a live concert event on the site of the massacre at Heuvelland, Belgium this past June. Luciferian Towers is Godspeed’s third album since the group’s ‘reunion’ in 2011 and their second consecutive single LP-length record (following three double-album releases in 2000, 2002 and 2012).